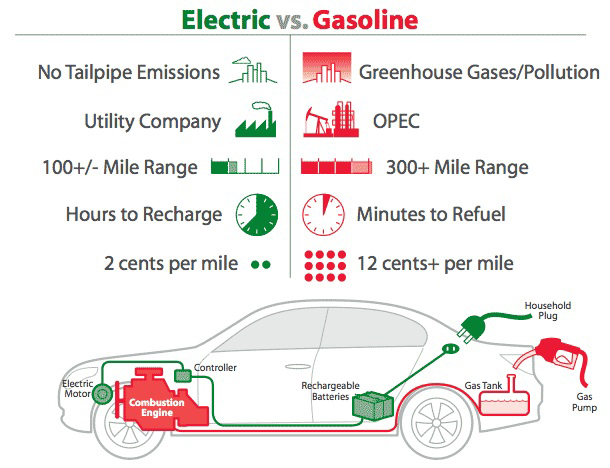 The electric vehicle is a vehicle that runs on electricity alone. Such a vehicle does not contain an internal combustion engine like the other conventional vehicles. Instead, it employs an electric motor to run the wheels. These vehicles are becoming very popular nowadays. They are considered to be a promising solution for the future transportation. The most common example is Tesla. Electric Battery: Battery stores the electricity required to run the vehicle. The battery supplies electric current to the motor. And thus, the vehicle runs. The higher the capacity of the battery the higher is the range of the electric vehicle. Most modern electric vehicles use Lithium-ion type batteries. These batteries have higher energy density. It means they are capable of storing more energy. Inverter: battery stores the electric current in the form of Direct Current (DC). But, the majority of the motors used in the electric vehicles run on Alternating Current (AC). So, the inverter performs the function of converting DC to AC. Electric Motor: An electric motor provides the power to rotate the wheels. Motors may be of DC/AC type. However, the AC motors are more common. Regenerative Braking System: The electric-vehicle has only limited energy available. Hence, you need to save every bit of it. This system recovers the energy lost in braking the vehicle and utilizes it to charge the batteries. Power Control Unit: The control unit performs the main task. It controls the activities of all the components of an electric vehicle. It monitors the output of the motor, charging of batteries. Also, it provides the necessary information to the driver. Less air pollution: There is an absence of any combustion process. Hence, these vehicles do not emit polluting gases into the atmosphere. So, they cause less harm to the environment compared to traditional IC engine powered vehicles. Less noise pollution: The electric motor runs quietly. Hence, the noise level while operating these vehicles is much lower than that of the petrol or diesel engine powered cars. Thus, it results in very less noise pollution. Higher efficiency: The efficiency of operation of an electric vehicle is much higher. For e.g. the efficiency of an electric motor is nearly 90% compared to an Internal combustion engine. Hence, in all, an electric-vehicle is more efficient than petrol or Diesel vehicle. High price: The production of electric-vehicles is not yet done completely on a commercial basis. Hence, these vehicles are costly than conventional cars running on petrol or Diesel. Low range: Range of an electric-vehicle is the distance that it can cover on a single charge. There have been recent advances in the battery technology. However, the range of these vehicles is still not on par with that of the regular vehicles. Also, some of these vehicles are suitable only for low-speed applications. 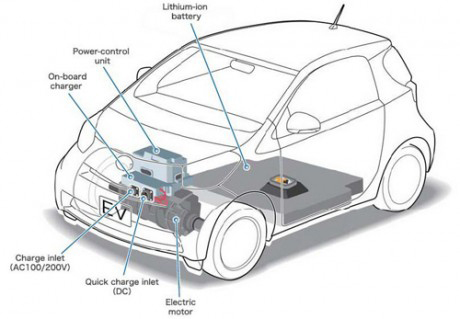 Home » Technical Anatomy » What is an Electric Vehicle (EV) and How Does it work? Know More. What is the Traction Control System (TCS) in cars?